The most wonderful package arrived at my doorstep today (coincidentally on my birthday). href=”http://soldiersangels.org”>Soldiers’ Angels (over 900 waiting for adoption right now) Operation Overseas Mardi Gras was such a huge success this year that the news articles and pictures keep rolling in thanks to so many wonderful people as far away as Germany. The package contained the most beautiful American Flag I have ever seen because it was sent with love and a framed certificate (see below). These items will be placed in Soldiers’ Angels Museum for all to see because it was sent because so many of you stepped up to the plate and helped send Mardi Gras cheer to our troops – Hooah! 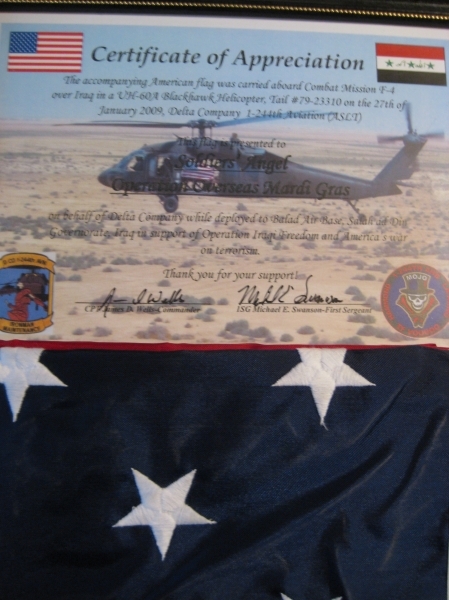 ” The accompanying American flag was carried aboard Combat mission F-4 over Iraq in a UH-60A Blackhawk Helicopter, Tail #79-23310 on the 27th of January 2009, Delta Company 1-244th Aviation (ASLT). This flag is presented to Soldiers’ Angels Operation Overseas Mardi Gras on behalf of Delta Company while while deployed to Balad Air Base, Salah ad Din Governorate, Iraq in support of Operation Iraqi Freedom and America’s Was on terrorism. “We will not waiver, we will not tie; we will not falter, and we will not fail. Peace and freedom will prevail.” President George W. Bush October 7, 2001.